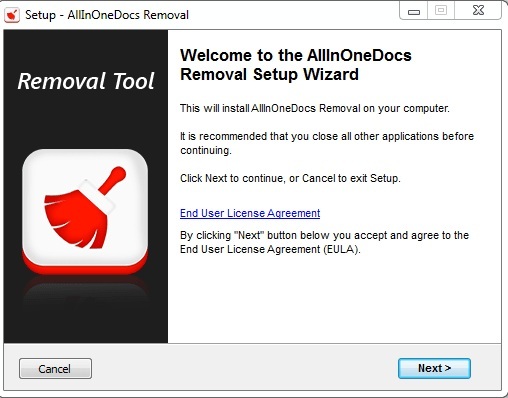 AllInOneDocs is as an ad-on for your browser. It promises the computer users to allow access to free Office suite online, such as Word processor, Spreadsheet, etc. but actually, it is a PUP or more specifically a browser hijacker. Once it gets inside the PC, it can take control over the browsers by changing its settings. 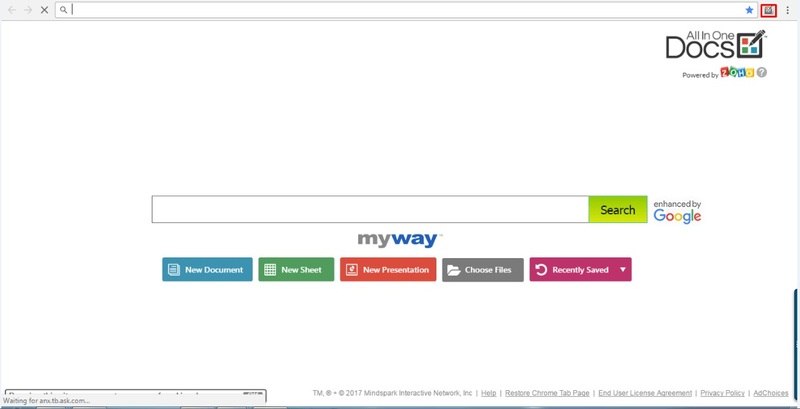 It replaces the default search engine, new tab page, and search engine with search.myway.com. 1. Your default search engine changes to search.myway.com. 2. Once search.myway.com. is set as your default search engine, you will see modified search results having several sponsored links and ads. 3. You may observe different malfunctions. 4. Your browsing sessions may be recorded and may later be transferred to third parties. 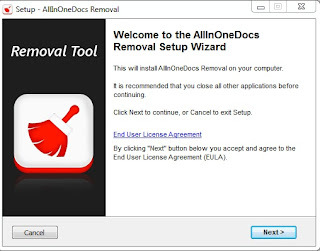 How to remove AllInOneDocs using AllInOneDocsRemovalTool? 2. Open the tool by double click on its icon. 3. Click on ‘Yes’ to run the program when the Windows prompt appears. 4. After the launch of the setup, click ‘Next’ on the window which appears. 5. In the following screen, type ‘Y’ for ‘Yes’ to initiate the process of scanning. 6. In the next screen, type ‘Y’ for ‘Yes’ to allow the tool to close all the browsers and continue the cleaning process. 7. The removal process is now completed. How to Remove Search.searchmpct.com Browser Hijacker? What is search.searchmpct.com (Convert That PDF)? 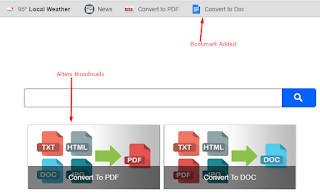 search.searchmpct.com (Convert That PDF) is a browser hijacker which affects your browser adversely. 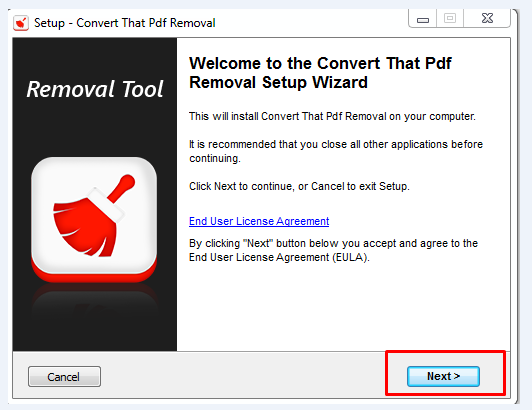 It is a deceptive application which claims to allow conversion of various file formats to PDF and vice versa. However, you may not even remember installing it. It may suddenly appear on your browser. This browser hijacker can get into your computer by various methods. One of the most prominent being an attempt to search for a free software to convert one file format to another. For e.g., converting word file to PDF or vice versa. What actually happens is that these free software or sites install unwanted add-ons which hijack the homepage and the search engine of your browser. Say if your default search results were earlier displayed by google.com, but after the installation of such hijackers, the search results could be redirected to other search providers. How to Remove searchmpct using ConvertThatPDFRemovalTool? 3. When the Windows prompt appears, click ‘Yes’ to allow the program to run. 4. Click ‘Next’ on the next window when the setup launches. 5. In the following screen, type ‘Y’ for ‘Yes’ to start the scanning process. 6. Quit all the browsers and in the subsequent screen, type ‘Y’ for ‘Yes’ to allow the cleaning process. 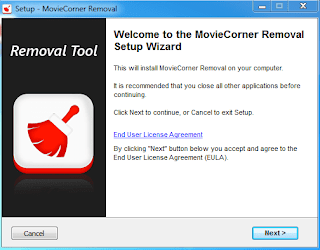 How to Remove Search.moviecorner.com Browser Hijacker? search.moviecorner.com is an extension for your browser which claims to provide quick access to various movies online. Although, it is actually a browser hijacker which controls and plays with your browser settings. It changes the homepage and new tab page of your browser to search.moviecorner.com. It silently installs various third-party applications and browser plug-ins. It significantly diminishes the web browsing experience. 1. The homepage and new tab page of your browser have been changed to search.moviecorner.com. 2. When you type anything in the search box, you are redirected to search.ozby.com. 3. The browsing speed of your web browser has significantly been slowed down. 4. Numerous annoying banner ads related to online stores, such as eBay, Amazon, etc. are displayed on the browser. How to Remove search.moviecorner.com using MovieCornerRemovalTool? 2. Now, open the tool. 4. When the setup launches, click ‘Next’ on the window which appears. 5. In the subsequent screen, hit ‘Y’ key to start the scanning process. 6. In the next screen, hit ‘Y’ key to allow the tool to close all the browsers and carry on the cleaning process. 7. The removal process is completed. You can read the text file which appears after the removal process to check the logs of the deleted files.